Those are some big birds. 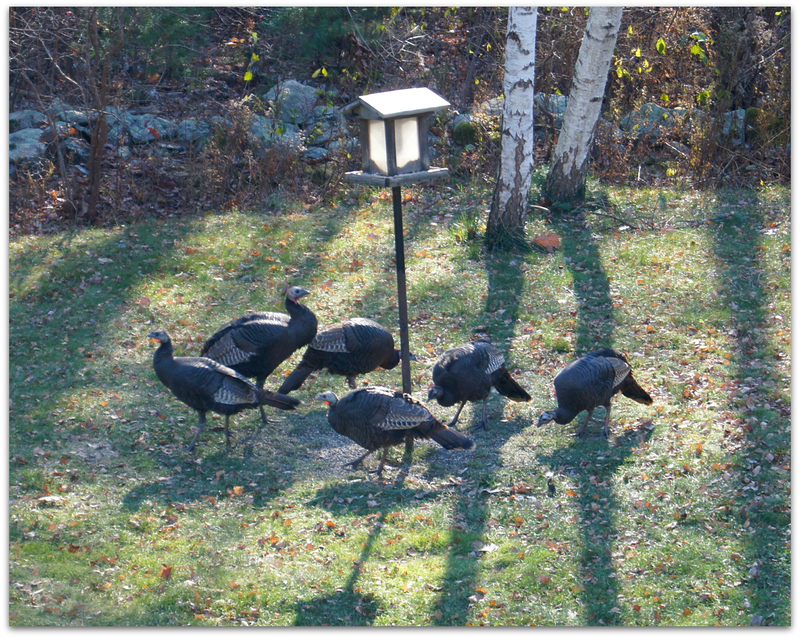 We see more wild turkeys from late fall through the winter as they come out of the woods to look for easy food. And every year there seem to be more turkeys than the year before. 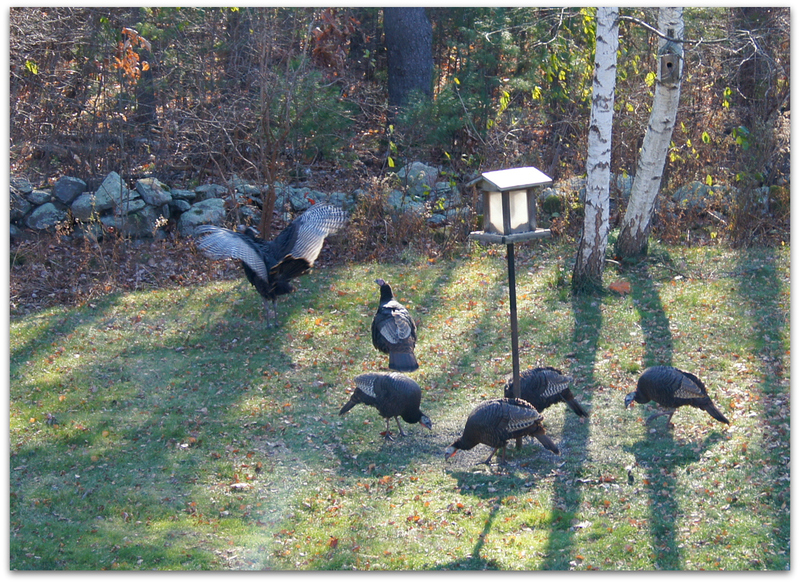 Presumably these are Eastern Wild Turkeys, a subspecies of Meleagris gallopavo (silvestris). They number from 5.1 to 5.3 million birds. They were first named ‘forest turkey’ in 1817, and can grow up to 4 ft (1.2 m) tall. The upper tail coverts are tipped with chestnut brown. Males can reach 30 lb (14 kg) in weight. The eastern wild turkey is heavily hunted in the Eastern USA and is the most hunted wild turkey subspecies. I have never tasted wild turkey, but I would like to someday… and compare the flavor to Meleagris butterballus. Impressive wings. They look ungainly, too big to fly, but I have seen them take off high into the trees when my dog ran into the backyard. A bizarre sight. … wild turkeys have had the same comeback history as geese and deer, and an even sharper trajectory, going from the edge of extinction in the 1920s to abundance a half century later. Then, just as quickly, they too went from novelties to nuisances. Here was one of the wiliest of wild creatures, one that would in the deep woods flee in an instant at the slightest movement by a hunter otherwise invisible in camouflage, suddenly turning up where people lived in the suburbs like an overgrown robin. Here’s a review of the book by Russell Baker writing in the NY Times: Visitors. Here is a Thanksgiving-appropriate cocktail from the Wild Turkey bourbon website. Tipple before the feast this Thursday, or save it for a cold night and a good book by the fire. 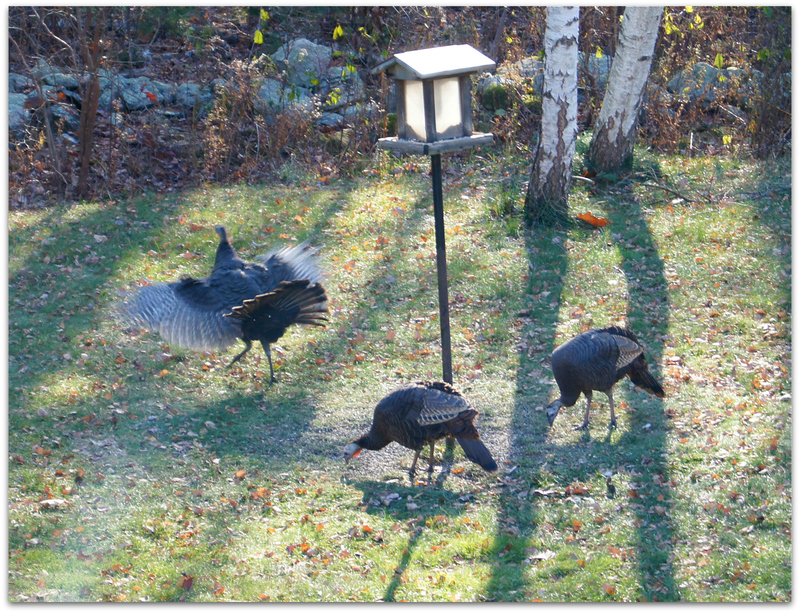 This entry was posted in Uncategorized and tagged birds, cocktails, Eastern Wild Turkey on November 22, 2014 by Amy.